Restocked. The original 1968 studio recording of Black & Beautiful, Soul & Madness by Amiri Baraka & The Spirit House Movers is finally available. Originally released on Baraka's legendary Jihad label (along with the Sun Ra/LeRoi Jones collaboration A Black Mass. "After 40 years of constant chatter and occasionally a snippet heard by some radio DJ who had a copy, this record has for most people been something that they heard about but never heard. 'Beautiful Black Women' was both a love song and an anthem coming to us in the midst of the fire that was the '60s. 'Madness' was always my favorite because it spoke about the ultimate conclusion of a society going mad. It is even more relevant today than it was then. With this release, Sonboy Records continues its commitment to re-issuing the entire Jihad catalog." --Thomas J. Porter. "The spoken word/soul/jazz albumBlack & Beautiful, Soul & Madness is both an invaluable artifact of its political and musical moment, as well as a challenge to contemporary listeners to listen harder and more thoughtfully about what our music is daring us to do. 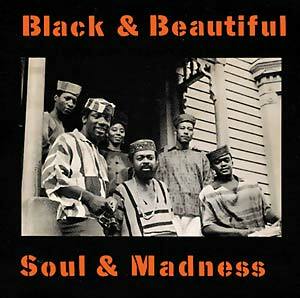 The opening track, 'Beautiful Black Women,' features Baraka reciting, or rather expounding, his poem with accompaniment by an understated bass by Bobby Lyle and the Singers cooing the refrain from 'Ooo Baby Baby' by Smokey Robinson and the Miracles. Anticipating the mash-up genre by several decades, Baraka and the Spirit House Movers throw down the gauntlet immediately: here we have, in one track, the soul-pop hit and Baraka's exhortation to and excoriation of a Black American culture obsessed with Whiteness, the one sound commenting on and complementing the other. The juxtaposition is precisely the point. The performance is an embodiment of Baraka's 'blues people' (articulated in his eponymous book), the continuum of Black music and art that, he argues, resists a (Western) aesthetic that would divide art into high and low or folk and serious. We are not allowed to simply sit back and groove, although the groove is still there. The album could almost be played at a party; if enough drinks are passed around, the party guests might not notice Baraka's conclusion that "The White man, at best, is corny"...The work is not merely historical or documentary (although that aspect of the recordings is crucially important); these records must be heard, in all their shocking beauty and ugliness, as part of a living art." -- Brent Mix/Junkmedia.org. The Spirit House Movers: Freddy Johnson (lead & tenor), Leonard Cathcart (tenor), Aireen Eternal (2nd tenor), Gilbert Monk (baritone), Yusef Iman (bass), LeRoi Jones (Amiri Baraka) (spoken-word).